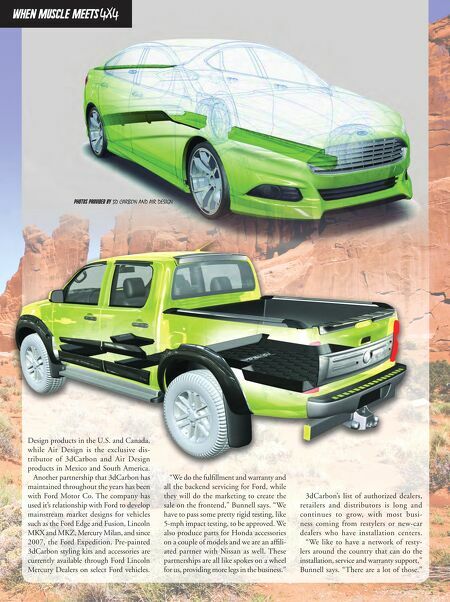 restylingmag.com January 2015 | Restyling & tRuck AccessoRies 23 when muscle meets 4X4 Design products in the U.S. and Canada, while Air Design is the exclusive dis- tributor of 3dCarbon and Air Design products in Mexico and South America. 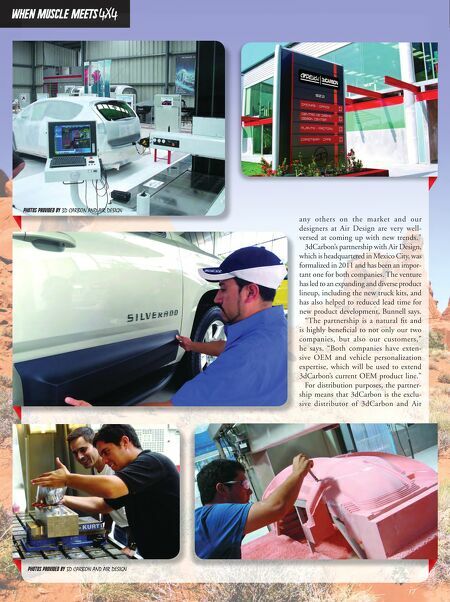 Another partnership that 3dCarbon has maintained throughout the years has been with Ford Motor Co. The company has used it's relationship with Ford to develop mainstream market designs for vehicles such as the Ford Edge and Fusion, Lincoln MKX and MKZ, Mercury Milan, and since 2007, the Ford Expedition. Pre-painted 3dCarbon styling kits and accessories are currently available through Ford Lincoln Mercury Dealers on select Ford vehicles. "We do the fulfillment and warranty and all the backend servicing for Ford, while they will do the marketing to create the sale on the frontend," Bunnell says. "We have to pass some pretty rigid testing, like 5-mph impact testing, to be approved. We also produce parts for Honda accessories on a couple of models and we are an affili- ated partner with Nissan as well. These partnerships are all like spokes on a wheel for us, providing more legs in the business." PHOTOS PROVIDED BY 3D CARBON AND AIR DESIGN 3dCarbon's list of authorized dealers, retailers and distributors is long and continues to grow, with most busi- ness coming from restylers or new-car dealers who have installation centers. "We like to have a network of resty- lers around the country that can do the installation, service and warranty support," Bunnell says. "There are a lot of those."